Cavan and Monaghan Education and Training Board (CMETB) launch an exciting new Architectural Technology and Computer Aided Design Traineeship in partnership with locally based international company, Entekra. This new QQI Level 5 Architectural Technology and Computer Aided Design Traineeship will operate in conjunction with Entekra and is due to commence in September 2018. The Traineeship places high emphasis on Computer Aided Design (CAD) and Parametric CAD but also includes Architectural Drawing, Design Skills, Communications, Work Experience, Mathematics, Materials Science and Spreadsheets Methods. Students will study at Monaghan Institute and complete 12 weeks placement in Entekra. A Career Traineeship is an occupational skills development training programme that is tailored to the identified needs of a specific industry sector or sub-sector and leads to nationally recognised qualifications. This Career Traineeship combines directed off-the-job training (classroom-based learning) with on-the-job training (work-based learning) delivered within the host company Entekra. This approach provides students with the opportunity to develop their skills, knowledge and competence within a supportive working environment. Undertaking a programme of learning in a real work context further increases the prospects of employment. Following completion of this traineeship, it is intended that many of the students will transition to employment with the company after successful interviews. Some may also wish to continue immediately with their learning and development. Career Traineeships are funded by the Irish Government and the European Support Fund as part of the ESF Programme for Employability, Inclusion and Learning 2014 – 2020. Entekra™ is a design, engineering and manufacturing company that provides a fully integrated off-site solution (FIOSS™) for both residential and commercial construction. At present the home construction market is the largest and most inefficient industry in the US. Entekra’s building system FIOSS™ aims to improve the residential and commercial model in the US by offering a more profitable alternative to the inefficient and often problematic on-site, stick-built construction methods currently used for more than 90 per cent of new-home construction. 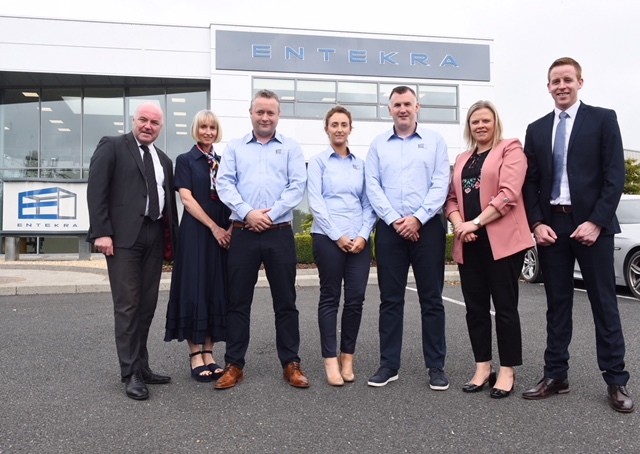 Following on from a recent investment of $55 million and the announcement of the expansion at Entekra’s European Headquarters in Gallinagh, Monaghan, successful students will have the prospect of joining the team with excellent opportunities to grow their careers within the company. Applicants may be eligible for a training, travel and meal allowance or a company bursary.